1. New image with 45 x 45 pixels. 2. From toolbar zoom to 1200%. 3. 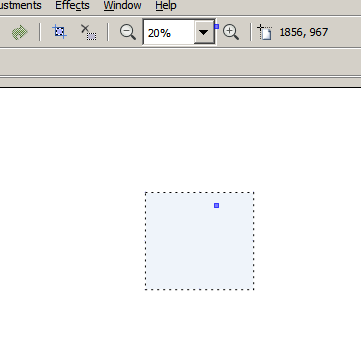 Rectangle / Ellipse Select. 4. Mark some area on canvas. Corners of selection are way way too big. The biggest problem is that it over-hides the image and it is hard to select proper selection. 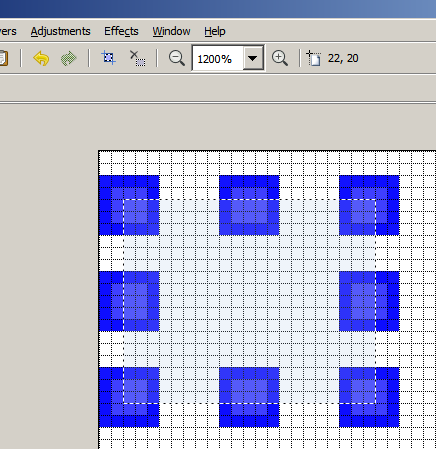 Most probably Pinta 1.1 regression, because this resize feature was added at v1.1. See attached picture for sample - notice huge blue corners. There is also vice-versa problem. On 3000 x 3000 image and using Rectangle Select no corners are visible to resize image. See attachment. A fix has been committed that solves the problem by scaling the nodes when zoom is changed. When zoomed all the way in there will still be a 1x1 px blue square for the handle, but this shouldn't be as much in the way as before. Good thing I'm concentrating on being more incremental in my git commits!